This 15 Page Printable PDF workbook will help boy scouts as they work on earning the American Heritage merit badge. 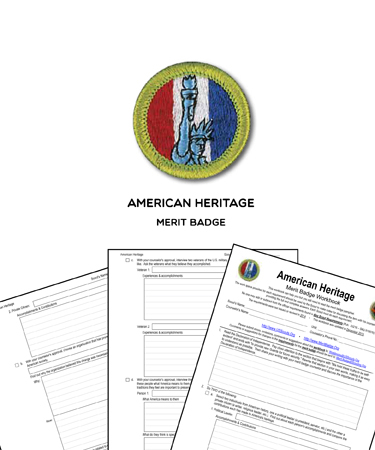 These worksheets include the necessary tasks and questions that are required for earning the American Heritage merit badge. Use this workbook as a guide as you organize your thoughts and prepare to meet with your merit badge counselor. When can merit badges be earned? Boy Scouts can begin earning merit badges as soon as they join a troop, so any scout can be involved in the merit badge earning process from the very start of their participation in the Boy Scouts! However, no merit badges are required for advancement until a Boy Scout reaches the First Class rank. Throughout their journey to First Class rank, a Boy Scout will learn basic knowledge of the Scouting ideals and the program, demonstrate basic Scoutcraft skills, and complete several safety exercises with parents. Why a merit badge requirement process? It’s important to note that advancement to Star, Life, and Eagle Scout rank all demand progressively harder requirements in the established areas of fitness, citizenship, personal growth, tools, cooking, first aid and emergency preparedness, aquatics, hiking and navigation, nature, outdoor ethics, and scout spirit. To demonstrate understanding of these areas, of course, the Scout must complete merit badges, service, and show significant responsibility. It stands to reason that merit badges are one of the key components of reaching each new rank, and allow the Scout to set specific, achievable, and measurable goals to accomplish. To ultimately reach Eagle rank — the highest rank and honor that a Scout can achieve — a Scout must complete a grand total of at least 21 Boy Scout merit badges listed in his handbook. Furthermore, a minimum of thirteen of these merit badges must come from the Eagle-required badge list that is also included in the handbook. Why earn a merit badge? Earning merit badges is a rewarding, fun process that allows Scouts to learn and demonstrate new skills, engage with their Scoutmasters, troop, and community in meaningful, goal-driven ways, and reach great achievements! Remember, though, that earning merit badges is about more than “checking a box” on a skill learned, or a task or project completed to agreed-upon requirements. The entire merit badge earning process provides Scouts with worthwhile introductions to interesting and innovative hobbies, inspires passion to pursue what were perhaps previously unconsidered careers. While the process below does describe many steps and articulates many considerations for all of those individuals involved in merit badge earning, it is not intended to be complicated, and culminates in invaluable results. Lastly, an earned merit badge is a forever merit badge. At whatever age or stage of his Scouting rank a Scout earns a merit badge from a registered and approved counselor, then the Scout may keep that merit badge forever and apply it toward his rank advancement (provided that they have fulfilled all the requirements specified and discussed with scoutmaster and merit badge counselor. Note on merit badge requirements: Those wishing to earn a merit badge should understand that all merit badge requirements must be met while the Scout is a registered Boy Scout or Varsity Scout, or a qualified Venturer or Sea Scout. Applicants must understand that accomplishments and achievements completed before joining the Boy Scouts, or conducted while a Cub Scout, cannot apply to merit badge requirements. Interested Scouts, Scout Buddies, and parents or guardians should review the steps below to gain an understanding of the merit badge process. 1) Decide on the badge. To begin, a Scout must decide on the type of merit badge he would like to earn. The Scout should discuss their options and interests with their unit leader to obtain a better understanding of expectations and requirements for each type of merit badge, and the merit badge in question. The Scout should also read the requirements of the merit badges that are of interest and pick one to learn; note that initial interest and passion about a merit badge subject can be helpful motivators to continue and carry on to achievement, should the project or process become challenging. 2) Get approved. The Scout must next obtain approval to begin the merit badge process from his Scoutmaster. The Scoutmaster may take this opportunity to lead more meaningful conversations about “challenge by choice,” and the Scout’s interests, goals, and plans for achievements. The Scoutmaster is fulfilling their guiding role by leading these important conversations, and so emphasize to the Scout that they provide a greater support than a simple signature of approval might lead one to believe. 3) Identify a merit badge counselor. Once the Scoutmaster has given his approval to begin the process and had a meaningful conversation about the Scout’s goals, the Scoutmaster will then help the Scout to identify possible merit badge counselors, as appropriate to the type of badge being earned. The Scoutmaster will likely have a list on hand of individuals who are interested in serving as counselors and who may have special knowledge in the merit badge area. These individuals are therefore committed to helping the Scout throughout the merit badge process. While selecting the merit badge counselor is the Scoutmaster’s responsibility, it could be that the Scout may already have a counselor in mind with whom he would like to work. The Scoutmaster and Scout should then work together and come to a reasonable agreement as to who the appropriate counselor would be. Merit badge counselors must be men or women of good character, age 18 or older, and recognized as having the skills and education in the subjects they cover. It is important, too, they have good rapport with Scout-age boys and unit leaders. Note that some merit badges (such as those related to archery or swimming) may involve activities for which the Boy Scouts of America has implemented strategies to improve safety, enhance the Scouts’ experiences, and manage risk. These activities often require supervision with specialized qualifications and certifications. Merit badge counselors who do not meet the specific requirements may use the services of helpers who do. 4) Select a Scout Buddy. The Scout should then pick out another individual who may attend all Scout meetings with the merit badge counselor. Known as a “Scout Buddy,” this Scout-selected individual could be another Scout, a parent, a guardian, a brother or sister, a friend, neighbor or other community member, or another family member that will understand the commitments of the merit badge process. While adult supervision and guidance on some badge work can be helpful, many Scouts find it productive to choose a fellow Scout as a Scout Buddy, as they will be able to counsel each other through the merit badge earning process. In addition, a fellow Scout will already be attending the same Scout meetings. It is a merit badge process requirement that the Scout Buddy attend meetings with the Scout, so the Scout should be sure to confirm their Scout Buddy’s availability and maintain clarity about expectations. 5) Inform the Scoutmaster of start date. The Scout should contact their Scoutmaster and let them know that he is prepared to start badge work. He should also let the Scoutmaster know the identity of the individual he has selected to aid him in the badge earning process. The Scoutmaster should give the Scout a signed Application for Merit Badge, No. 34124 (100-pack) or No. 618953 (25-pack). 6) Review merit badge requirements with the selected counselor. The counselor will will discuss the specific merit badge requirements with the Scout; again, these requirements may vary based on merit badge type. Upon hearing the requirements, the Scout will develop a project plan and a relatively firm completion schedule, rounded out with deadlines and even “check in” points at which time progress will be discussed with the counselor. The counselor may ask questions regarding which parts of the project are already completed, potential areas of concern or barriers to consider regarding completion. The Scout may suggest work or activities that he has completed prior to meeting with the counselor, and it is up to the counselor’s discretion as to whether or not to “count” these efforts toward the merit badge requirements. Ultimately, the counselor is encouraged to let their common sense prevail — for example, should a merit badge require a certain amount of camping and wilderness experience, it is reasonable for the counselor to allow the Scout to count the nights has already camped with his troop toward merit badge requirements. As the Scout follows his completion schedule and considers progress and his timeline, the counselor will fulfill their role by contributing experience, advice, and suggestions for improvement as needed until the Scout has met all of the previously described requirements for project completion. 7) Begin work to meet merit badge requirements. Unless the counselor or Scoutmaster have given other time-related recommendations, the Scout may start work on a merit badge requirement at any time. If the Scout runs into any difficulties or issues in completing parts of the requirement, they should let their counselor know immediately. 8) Review the relevant merit badge pamphlet often. In completion of each requirement, the Scout should review the merit badge pamphlet on the merit badge requirements. Review will ensure complete understanding of the requirements. While many Scoutmasters or counselors will provide the merit badge pamphlet, remember that many schools or public libraries will also have merit badge pamphlets available; Scouts, troops, counselors and Scoutmasters should consult the Merit Badge revision dates list to confirm that their merit badge pamphlets (and the requirements described therein) are completely up to date and accurately reflect the Boy Scouts of America merit badge expectations. 9) Meet with the counselor and present the project. When the Scout is prepared and feels that they have met the previously discussed merit badge requirements, they should contact their counselor to make an appointment. As an added consideration and check-in, the Scout may review their progress and project with their Scout Buddy. Practicing with the Scout Buddy can be a useful way for the Scout to build confidence and consider expectations before the formal, final meeting with the counselor. When the Scout meets with their counselor, they should bring along all of the materials that they have used to complete or meet the requirements — naturally, if the materials are too big, ungainly, or simply unreasonable to move, the Scout should either ask a parent for assistance or take a photo of the materials in question. For instance, if a Scout were attempting to meet the requirements of a cooking merit badge, it would be unreasonable for the Scout to bring an entire prepared meal to the their merit badge counselor; in this case, pictures and a complete written description would be appropriate. 10) Test with the counselor. During the meeting, the Scout should expect to be tested on each merit badge requirement — the counselor will be making sure that the Scout has truly met expectations, understands the project and the outcomes, and can complete the expected tasks relating to the merit badge itself. 11) Counselor approval or next steps. Once the Scout has presented and completed testing, the merit badge counselor should then certify completion or give the Scout directions for improvement and a discuss a new completion timeline. Note that a Scout does not need to pass all the requirements of one merit badge with the same counselor — timing and location issues may arise, such that the Scout may have few options but to meet with a different counselor in order to meet badge requirements. The Application for Merit Badge will be marked to indicate that the badge is a “partial” until the Scout is able to complete the badge requirements under the guidance of another counselor. Partials expire on the Scout’s 18th birthday. 12) Once the merit badge counselor has certified completion of requirements, the Scout will be presented with the merit badge at a court of honor or the next troop meeting. At camps, fairs, or similar events, Scouts may find opportunities for merit badges requirements to be met in group settings. For some types of badges, this option is acceptable or even preferable, and the “guest experts” in attendance at such events can offer valuable insight not otherwise available within the troop. Ultimately, though, it is the individual Scout’s responsibility to fulfill all of the requirements; each Scout must actually and personally complete the relevant merit badge requirements.